1. Direct3DX12TexturedRectange to create a Direct3DX12Rectangle specified by D3D12Rectangle structure . 2. Direct3D12RootSignature to create an ID3D12RootSignature with the specified number of descriptors of ConstantantBufferViews and ShaderResourceViews . 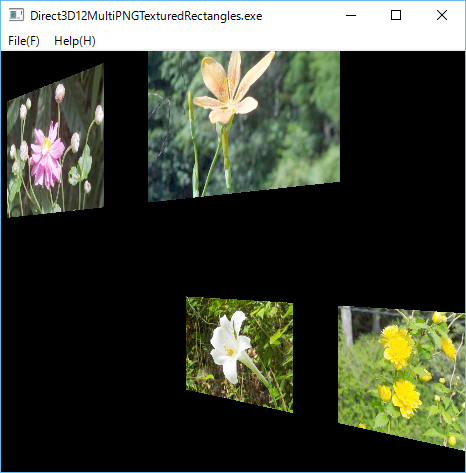 The following Direct3D12MultiPNGTexturedRectangles is a simple sample program to render four PNG textured rectangles which can be rotated by the left and right keys. * Copyright (c) 2016 Antillia.com TOSHIYUKI ARAI. ALL RIGHTS RESERVED. //Create a renderTargetView and a depthStencilView. //Delete a renderTargetView and a depthStencilView. // 2 Create a view of SimpleView. // 3 Post a resize request to this MainView.